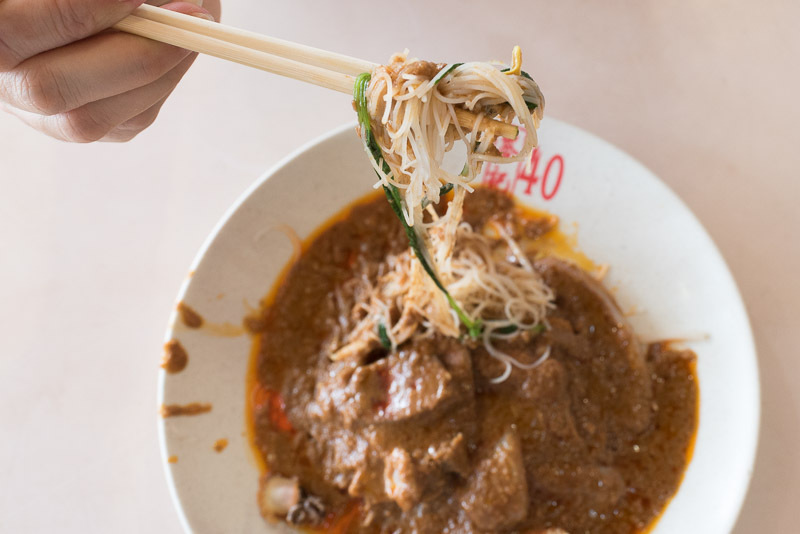 Located 10 minutes away from Redhill MRT Station by foot, this nondescript food centre is home to some really delicious hawker fare. 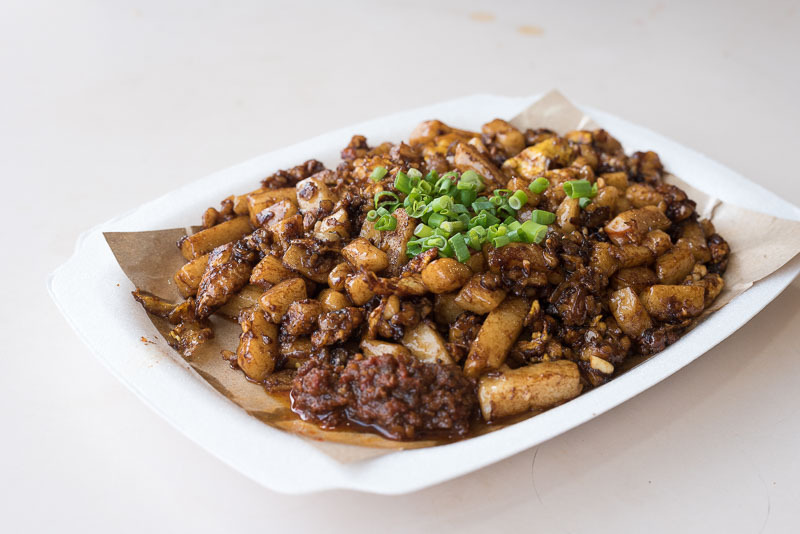 Also, the journey from the station to the food centre is mostly sheltered so you can drop by for some comforting local food no matter rain or shine. 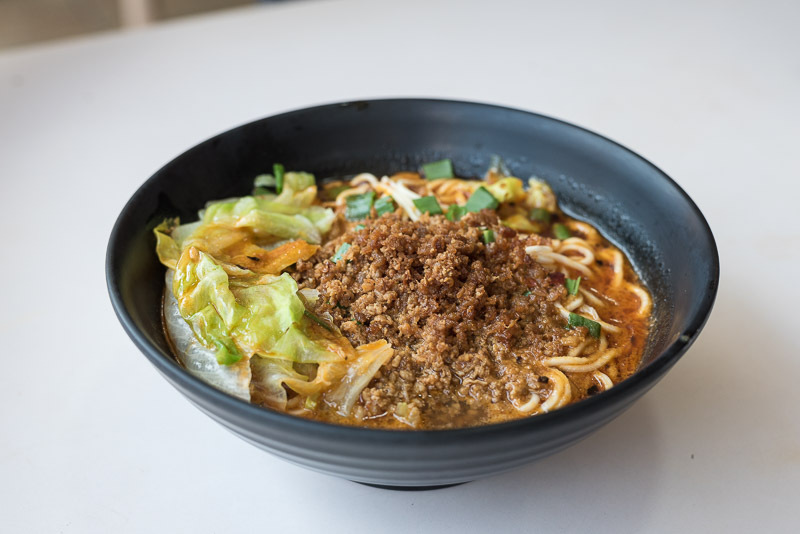 Often packed by lunchtime, there’s a dizzying array of food options available but here’s our take on the 10 stalls to seek out at Redhill Food Centre, and some of the dishes that you should order. It’s a little strange to kickstart this list with a side dish rather than a main dish but these Chicken Wings ($1.50 each) from Yan (焱) Fried Bee Hoon were absolutely divine! 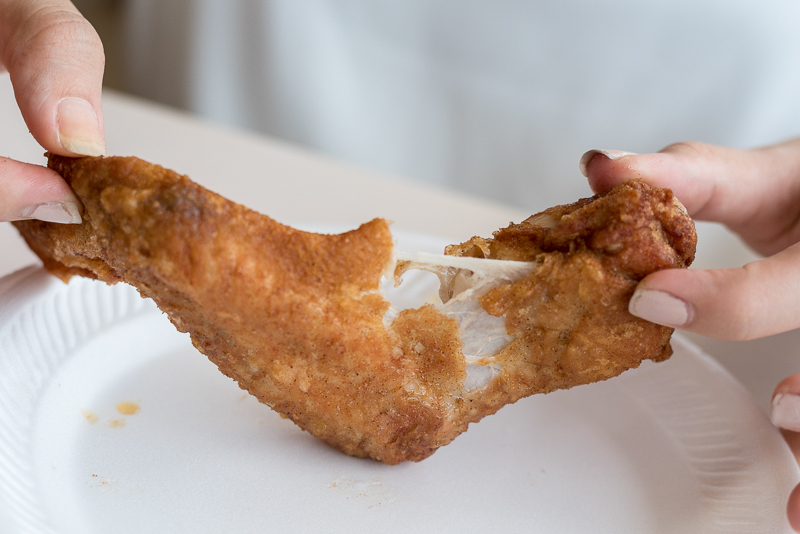 Hopefully you’ll score a plate from a freshly-fried batch — that’s when they’re the absolute best. The stall is so popular that diners sometimes have to queue for nearly 30 minutes for their turn. 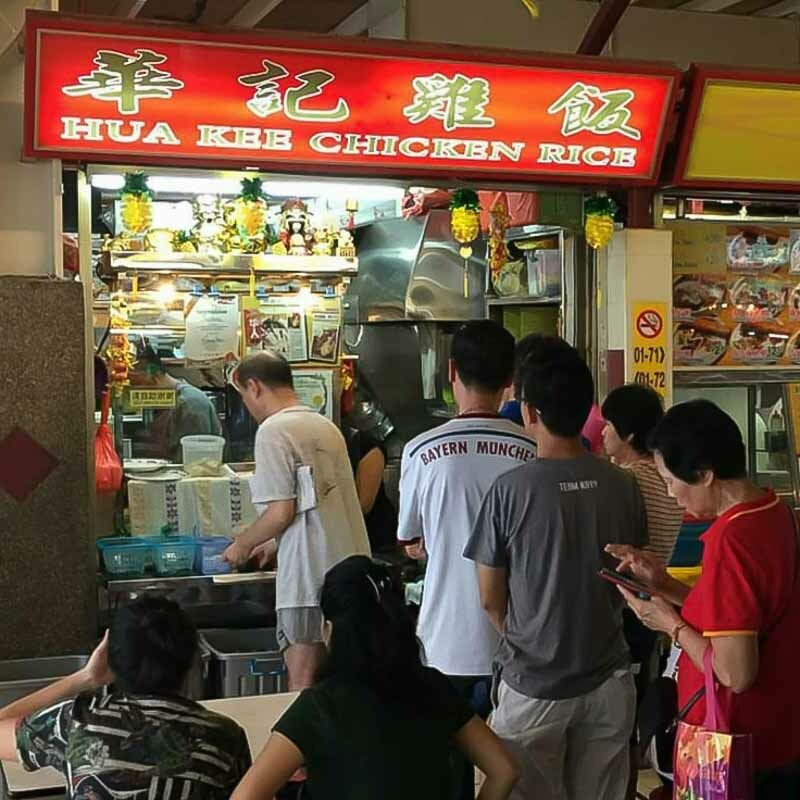 Even Prime Minister Lee Hsien Loong wasn’t spared; he was photographed queueing diligently to get his chicken wing fix from this very stall. The Chicken Wing was excellent on every level. It was extremely fragrant, and the crispy skin was so full of flavour and crackled as I bit into it, while the meat was tender and juicy. 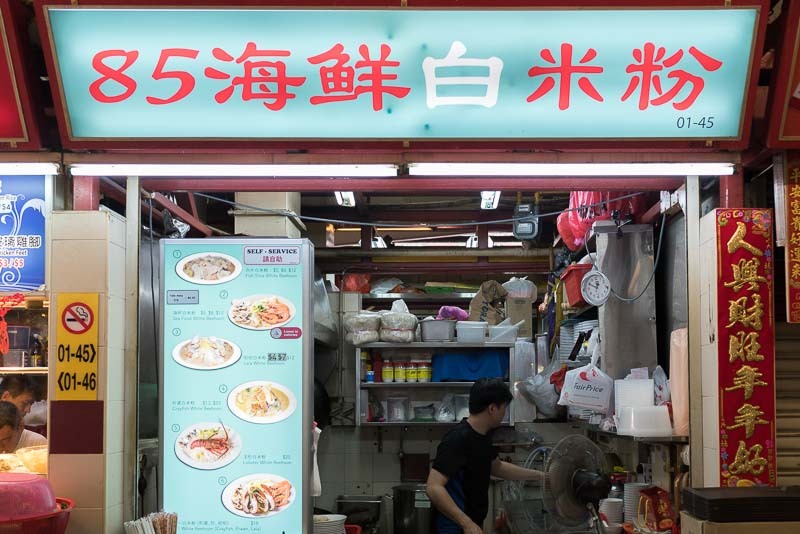 For a full meal, order their seriously cheap Bee Hoon ($0.60) and pair it with as many Chicken Wings as you can handle. 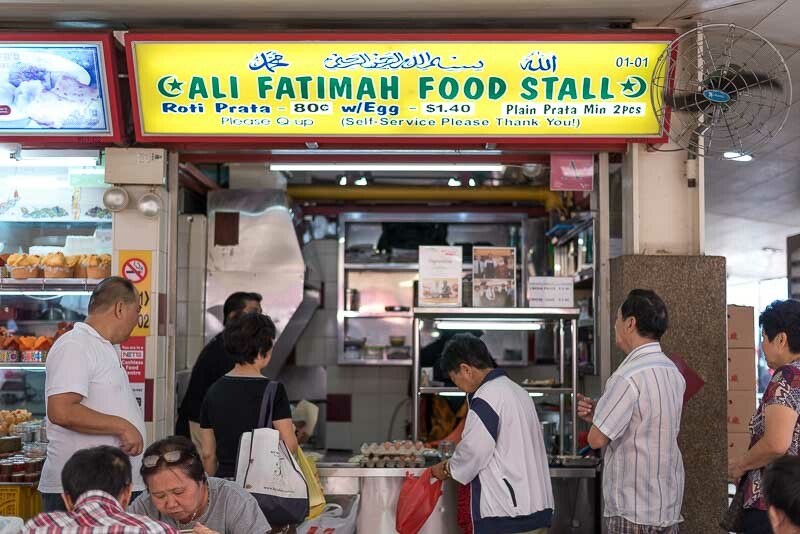 The Ali Fatimah Food Stall is one for the early birds as they often sell out by 10am on most days. We were fortunate enough to arrive when there was no one in the queue but just minutes after placing our order, a queue had already formed. 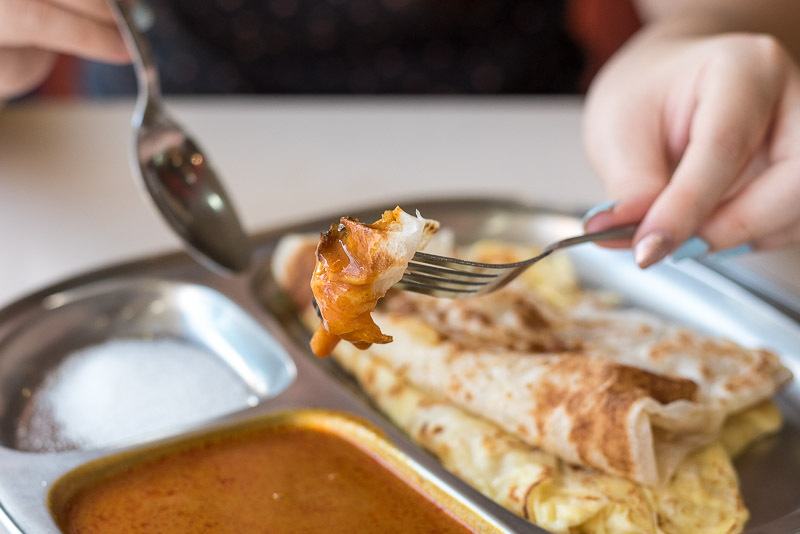 What’s special about this particular prata place is everything that it’s not; the prata wasn’t oily at all and the curry wasn’t watery or diluted. On the contrary, the curry was thick and robust, packed full of flavour. There was a nice kick to it but it wasn’t too spicy and didn’t agitate our tummies, especially since we were having it for breakfast. We enjoyed the curry so much that we contemplated asking for a second serving. Also, between the Egg Prata ($1.20) and the Plain Prata ($0.80), I enjoyed the former more. This made for the perfect breakfast and my friend swears by it. 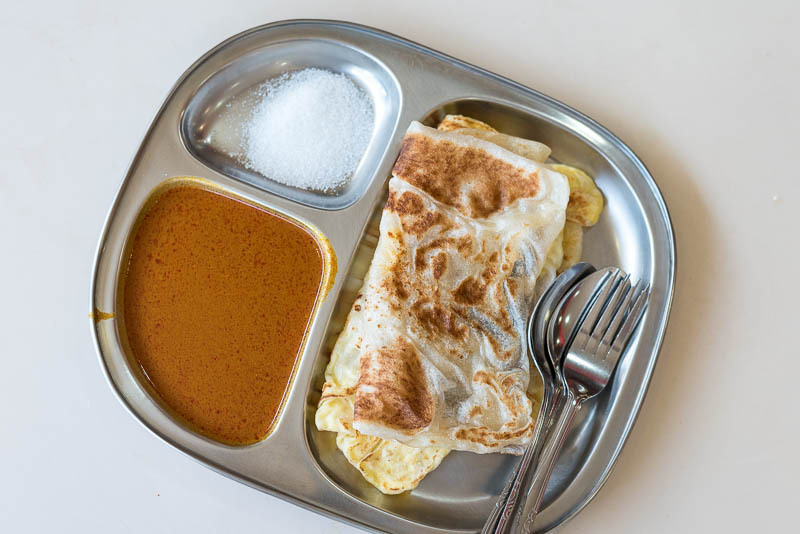 He even wakes up early on weekends just to have some prata before it’s sold out. This was quite possibly one of the best Xiao Long Baos ($4.50) I’ve ever had for this price point. I absolutely loved it! 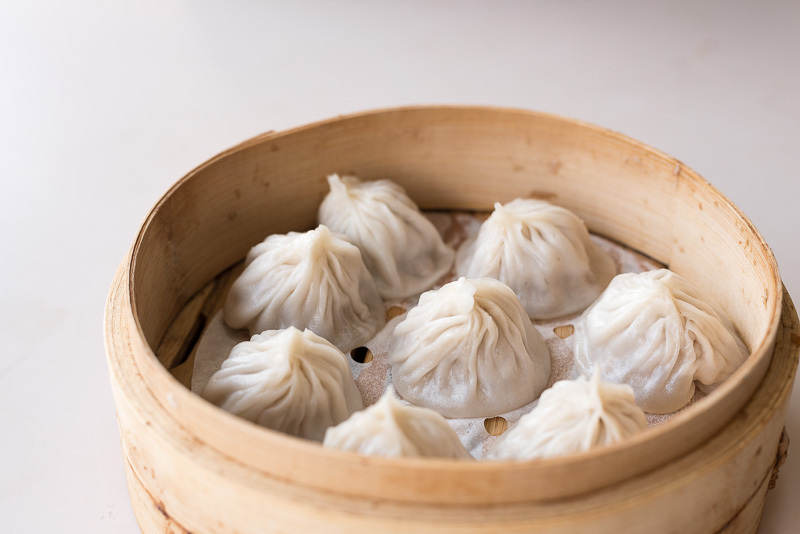 As I’m not the biggest fan of fatty meat, it was a pleasant surprise to discover that the meat used in the Xiao Long Bao was mostly lean pork. The broth was also rich and fragrant, encased by a skin that was of a nice thickness. It held the generous filling together and didn’t break easily when I was scooping it up. There was also none of that thick, floury taste. We also sampled the Dan Dan Mian ($4), which is another specialty of the stall. 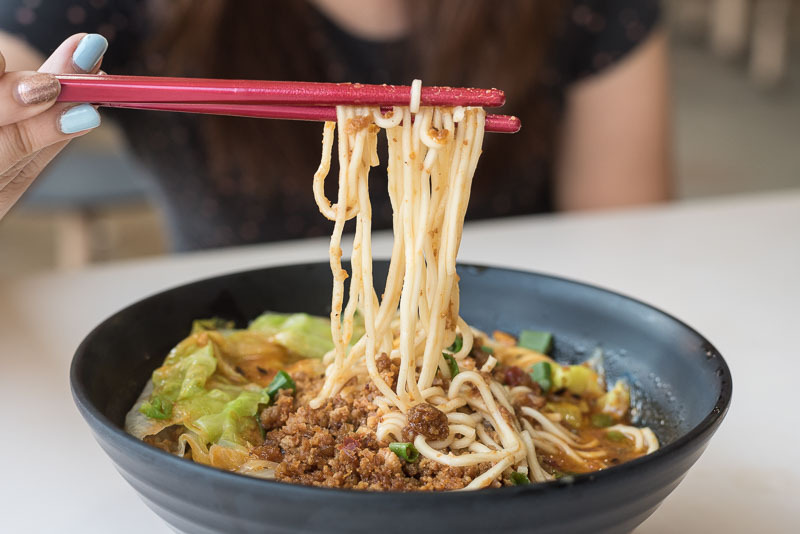 The noodles were springy and chewy and they were really generous with the dollop of minced meat that was mixed with crushed peanuts. The peanuts provided a nice crunch and the Dan Dan Mian was served with a soup base that was slightly sour. This dish may be more of an acquired taste and not everyone will appreciate it, but if you like slightly more tangy soups, I’m sure you’ll enjoy it! 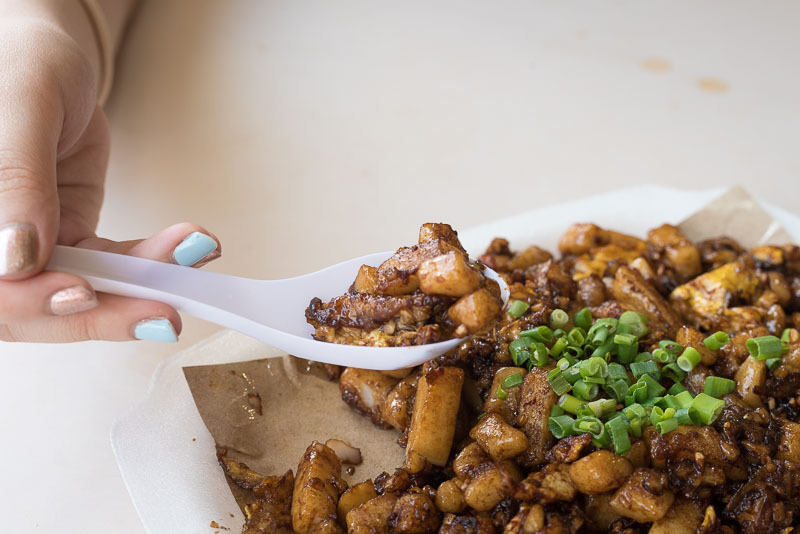 Carrot cake is a hawker food staple and I was pleased to see that Redhill Food Centre has a stall that really does the dish justice. We had the Black Carrot Cake ($3) from Zhong Ji which was super sinful and satisfying. The chunks of radish were slightly larger than usual, as were the pieces of fried egg, but the black sauce coated each piece evenly. I loved that there was a strong wok hei taste. Mixing in the sambal belachan gave the dish a nice kick that really made this a winner. 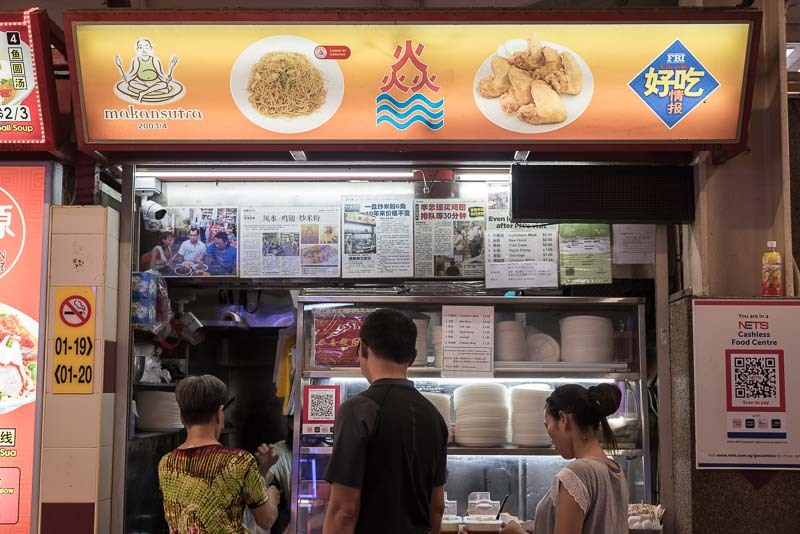 The stall also serves Hokkien Mee, so try that too when you’re there. 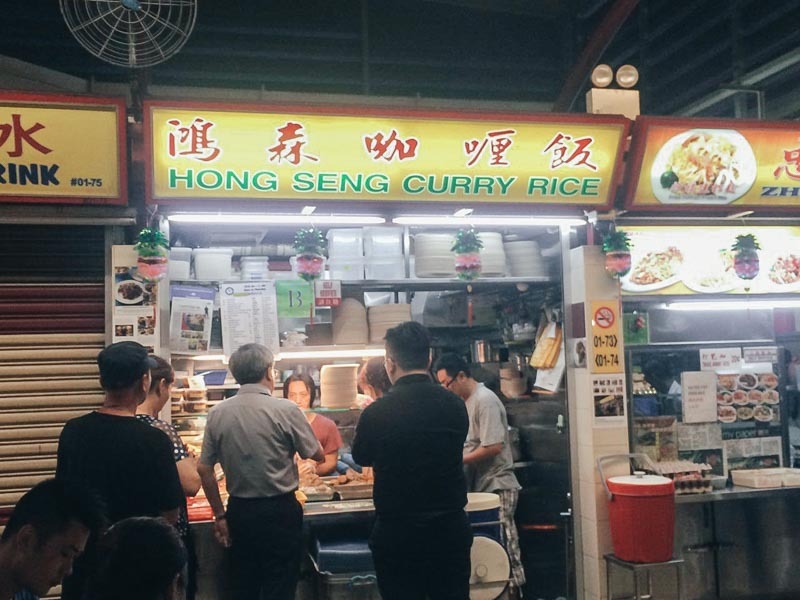 This is something I would consider more of a rare find since there aren’t many Satay Bee Hoon stalls left. 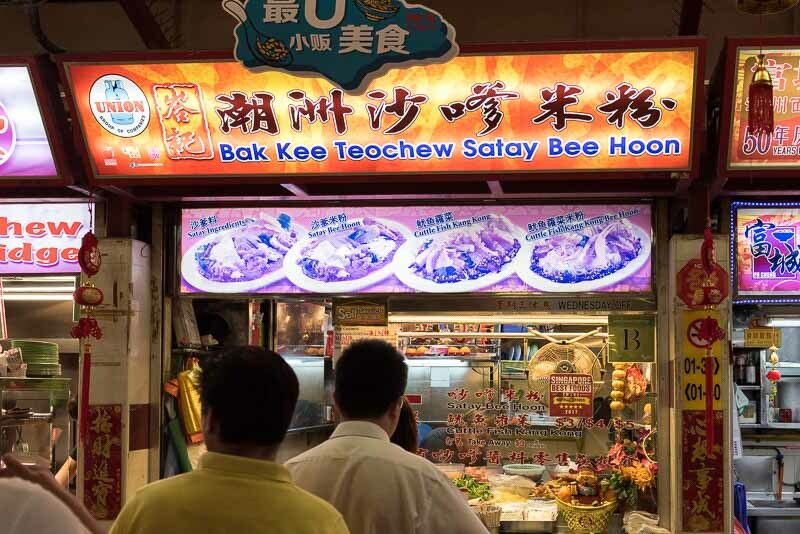 The perennial queue at Bak Kee Teochew Satay Bee Hoon is a testament to how tasty the dish was. The satay sauce was rather thick and packed a punch. It was super rich and fragrant and I just wanted to slather every spoonful of bee hoon in the sauce. Ingredients-wise, there were a few pieces of cuttlefish and pork liver, some tau pok and a bit of greens in the dish. The pork liver was quite tender and the tau pok that had absorbed the sauce tasted amazing. My only regret was ordering the $3 portion because it wasn’t enough to keep me full. Mind you, I’m not much of a big eater, so I’d say go for the $4 or $5 portions. 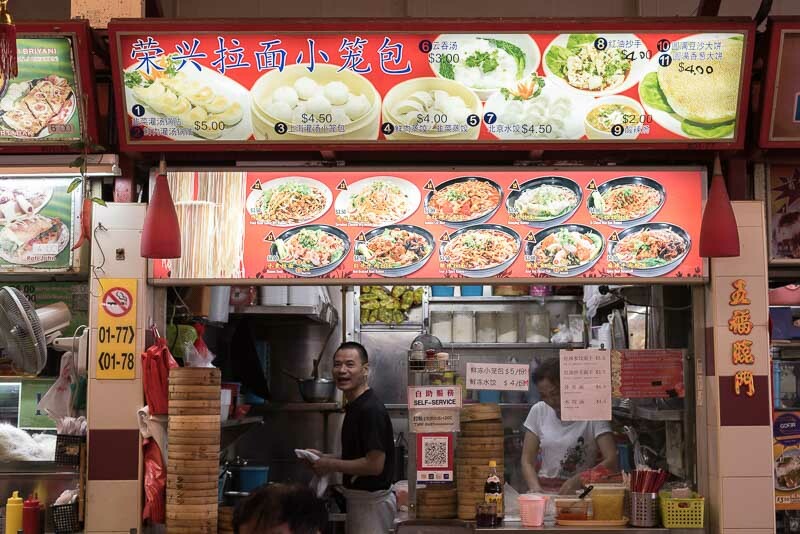 Here’s yet another stall that often boasts a snaking queue. 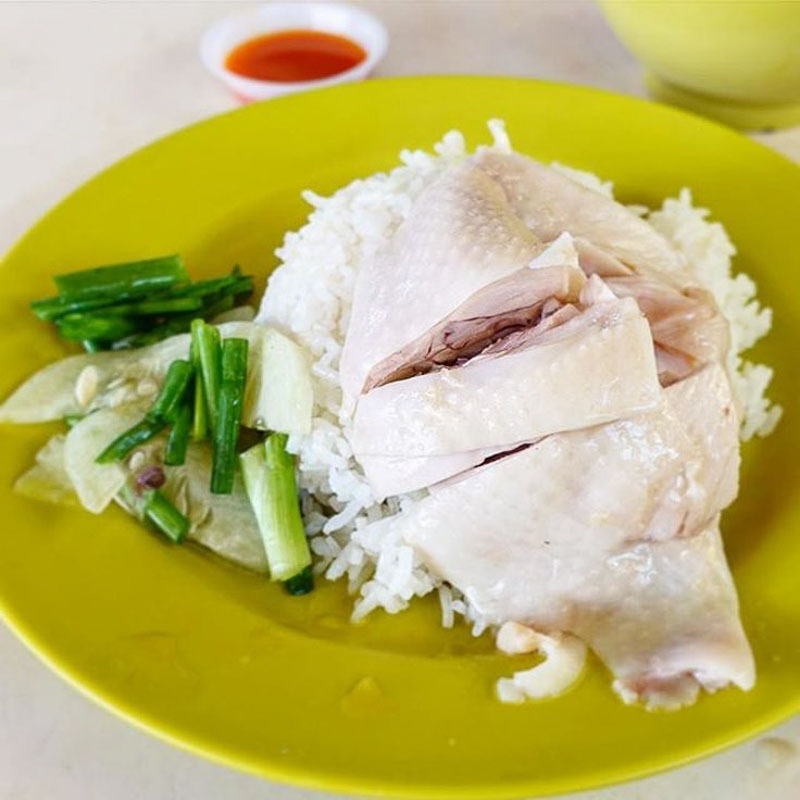 Lovers of bone and cartilage dishes will be pleased to know that Hua Kee serves its Chicken Rice ($3.50) with the chicken cut into thick slices without removing the sinewy bones. However, catching this Chicken Rice stall when it’s open is a bit of a challenge. Not only is it closed two days a week, it also closes after lunchtime on days when it’s open for business. This decision was necessary to preserve the freshness of the chicken meat as the stall’s chicken supplier does not provide deliveries on Monday. Unlike typical white bee hoon, the broth from this stall was a lot more watery and soupy. However, it was chockfull of the sweet seafood flavour and I enjoyed slurping the broth up just by itself. 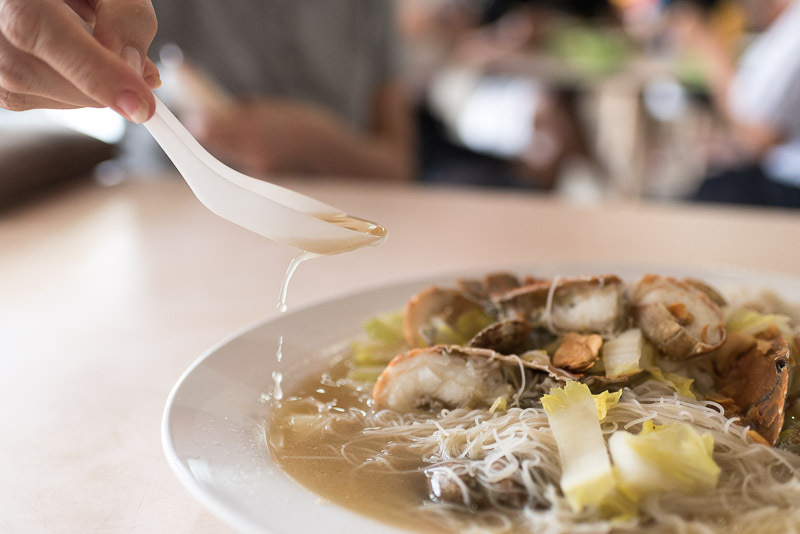 The silkiness of the bee hoon paired well with the broth and made for a very comforting and soothing dish. 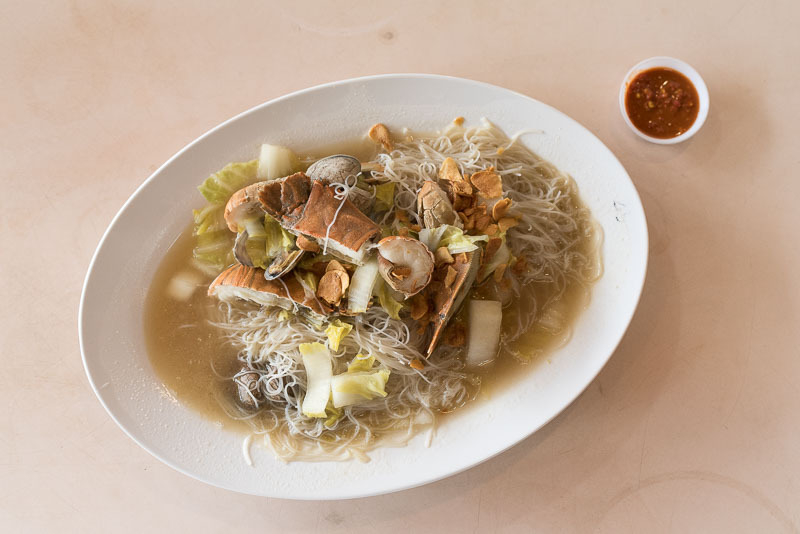 We tried the Crayfish White Bee Hoon ($13) but found the crayfish to be slightly on the smaller side. However, they were quite generous with the lala. Dipping the crayfish in the sambal chilli also added a nice kick to this otherwise fresh and sweet dish. 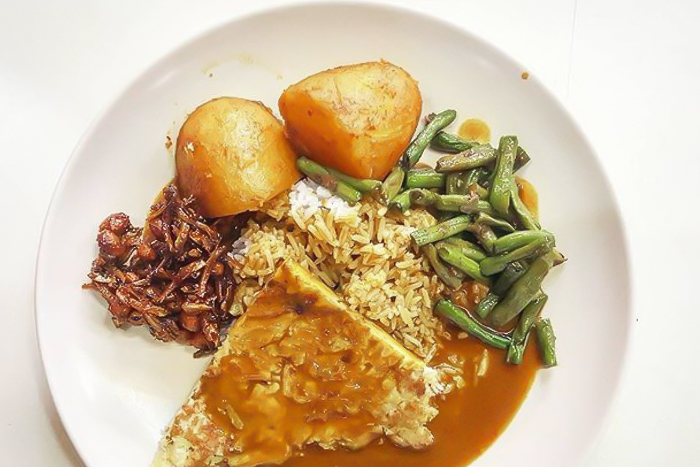 The curry from Hong Seng Curry Rice veered towards a stronger flavour; spicy and more assam in taste, it was closer to the flavours of Curry Fish Head instead of the usual sweeter, blander Hainanese curry rice sauce. 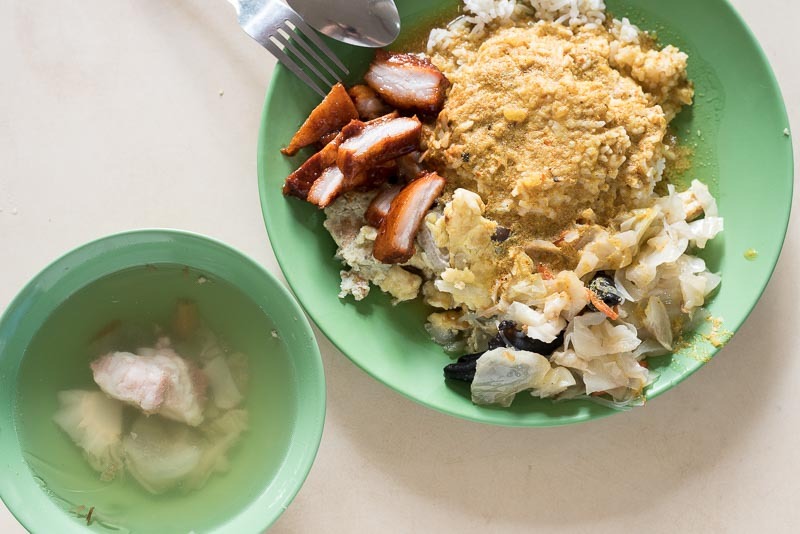 $3 will get you a decent portion, and when you’re there you should try some of the more uncommon additions, such as binjai, lap cheong, tofu and battered fried prawns (which looked really good). The pork chop also comes highly recommended so if you’re unsure of what to get, go for that! This stall had one of the longest queues I saw at the food centre. At 5pm, we tried sitting at one of the tables, waiting for the number of people queueing to dwindle. Fifteen minutes later, we gave up and joined as the queue was only getting longer. 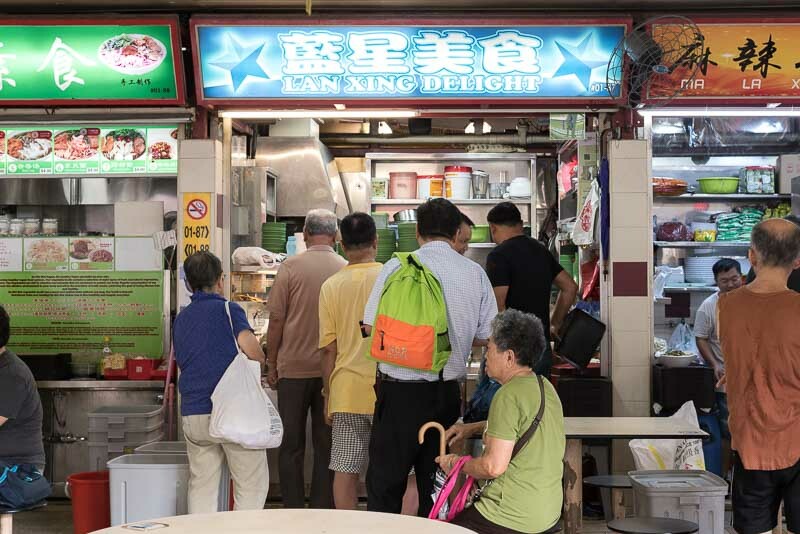 Lan Xing Mei Shi offers one of the cheapest meals in the whole food centre. 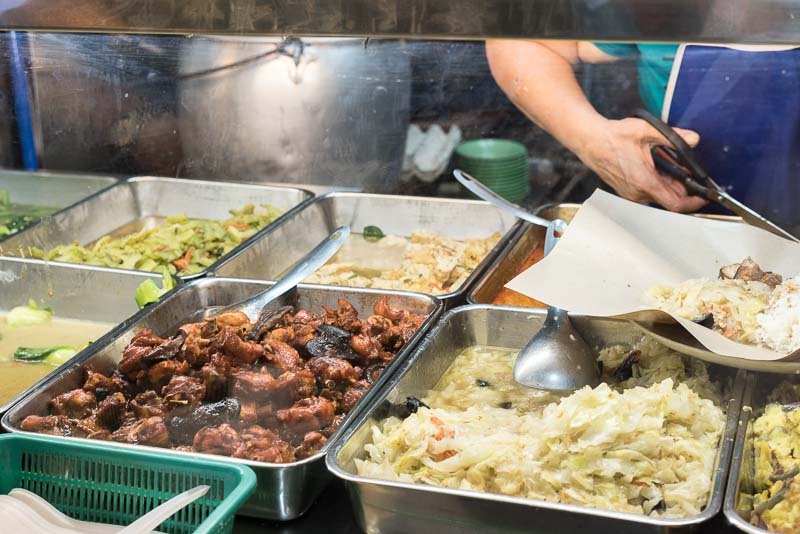 For $2.50, you’re able to get a plate of Cai Fan with two vegetables and one meat. 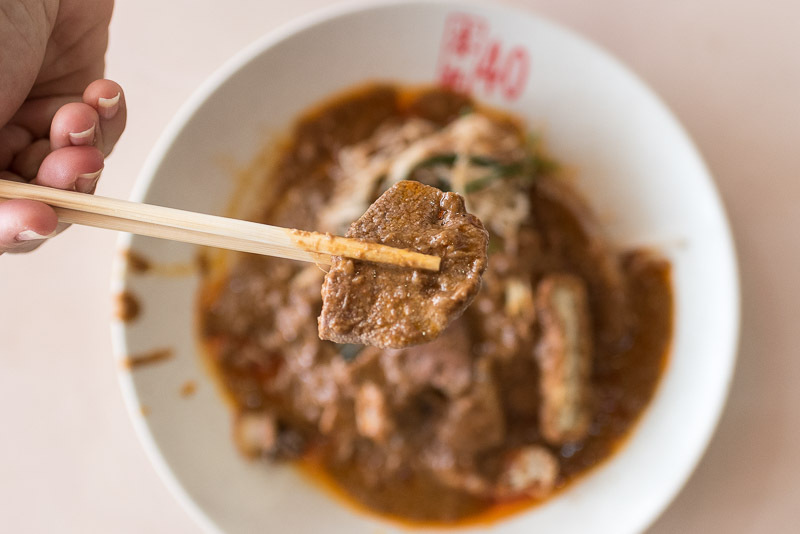 All orders are served with a bowl of soup and it’s not the typical, msg-ridden soup. Instead, the soup was boiled with pork meat and cabbage and carrots, making for a great accompaniment. The stall was quite generous with the char siew and it was nicely seasoned. However, I was slightly put off by how much fat there was in the char siew. Also, the curry, which looked so appetising, turned out to be slightly diluted and rather lacklustre. While it was nothing really worth fawning over, it’s hard to fault the meal when you bear in mind that it only costs $2.50. 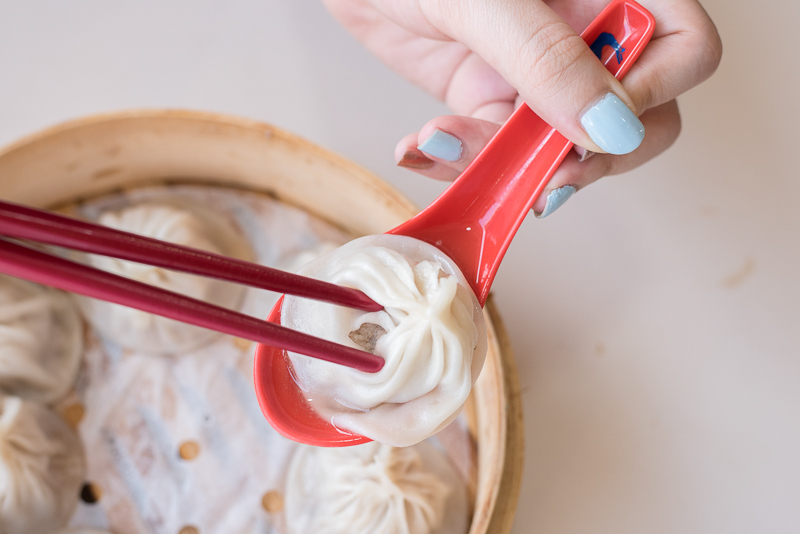 Good enough for this list if you’re looking for a cheap and filling lunch! 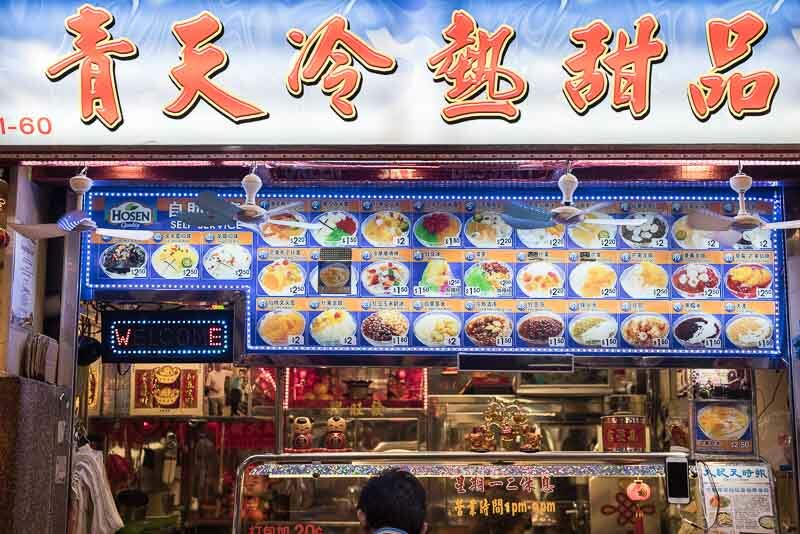 I used to be a firm believer that desserts are best enjoyed cold but the warm Tau Suan ($1.50) from Qing Tian Leng Re Tian Pin completely changed my mind. The soya beans were thankfully not mushy, thus adding a nice texture to the dessert. The best part was the you tiao, which remained chewy despite being coated in the sweet soup. Also, the slight saltiness of the you tiao contrasted nicely with the general sweetness of the dish. On warmer days, consider opting for the Mango Milk Ice ($2.50). This would be a really satisfying dessert for those who have a sweet tooth. 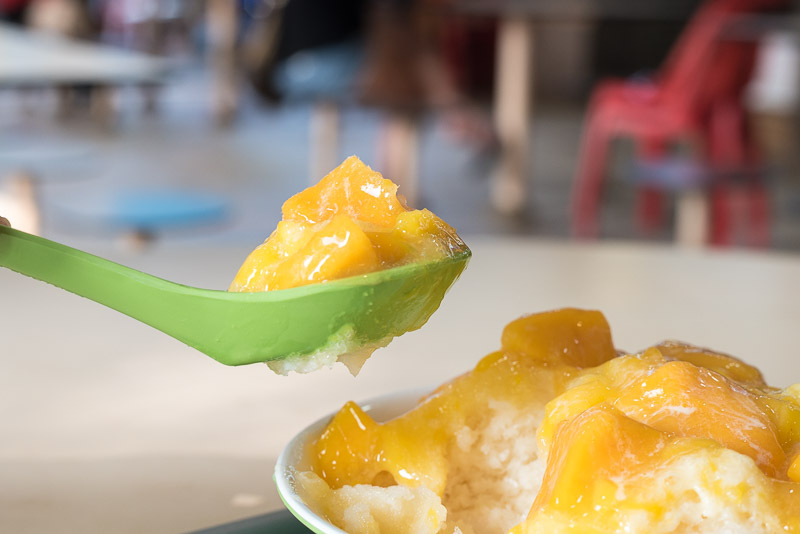 Each scoop of shaved ice had a creamy milky taste and the chunks of mango were large and really sweet. This was a great way to end a yummy day out in Redhill. Phew, there you go! 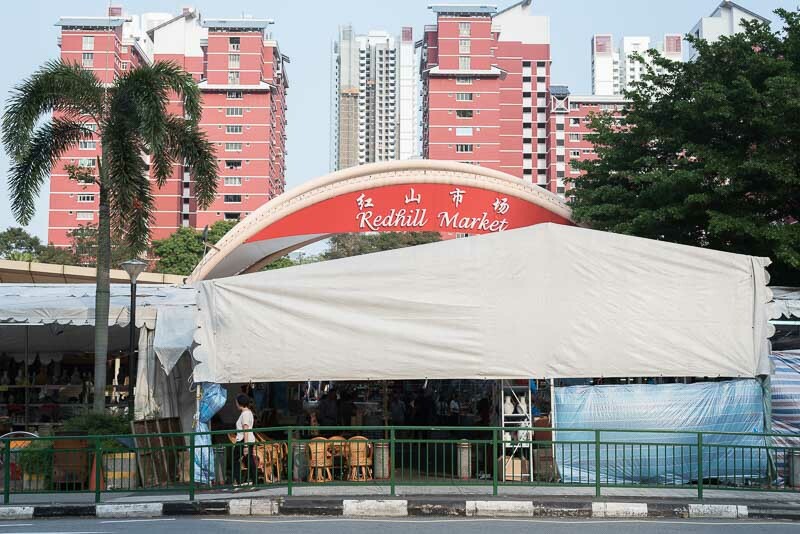 10 stalls to try at Redhill Food Centre. Some of these recommendations come from friends who have stayed in the nearby estates for pretty much their whole lives, so you can rest assured that these are solid. Let us know if we’re missing a gem or two! Having good food is my daily motivation to get out of bed.